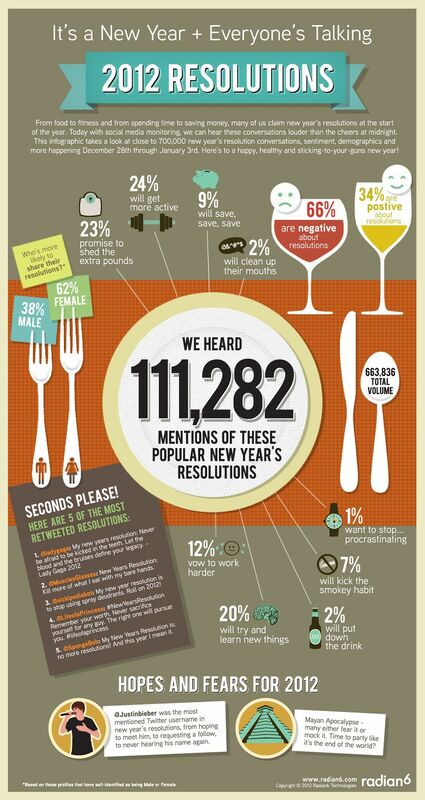 Yesterday social media monitoring firm Radian6 released an analysis of nearly 700,000 conversations about New Year’s resolutions from 28 December 2011 through 03 January 2012. They measured sentiment, demographics, subject, and a variety of other characteristics to arrive at the cutesy infographic included below. This entry was posted in Philosophy and introspection, Science and health, Social networking and media and tagged 2012, New Year's resolution, Self improvement by marshallstanton. Bookmark the permalink.